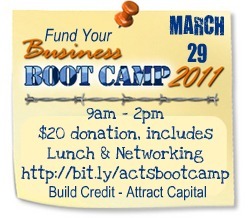 TOMORROW is the Small Business Bootcamp (http://bit.ly/actsbootcamp) 303Network is co-sponsoring with Midas Financial to benefit the ACTS Resource Center in Denver. There are many, many folks - some of them people that you know - who rely on the food assistance they are getting from ACTS to survive. In order to do our part to raise awareness and assist ACTS and our fellow associates and keep them going for ONE MORE MONTH we are offering this bootcamp. It is $20 to attend (100% of that goes to ACTS and is tax deductible), and guests will not only hang out with top Denver business leaders and be fed a wonderful buffet style lunch, they will also be taught HOW and WHERE to get the funding they need for their biz. If you are self-employed, would like to be, or have had your personal or business credit affected in any way by the economy of the last few years you can surely appreciate how valuable this is right now. This is not a pitch-fest, it is real education presented by real people in your network. complete the registration process, and we'll SEE YOU THERE! NEW BUSINESS NETWORKING EVENTS ADDED!